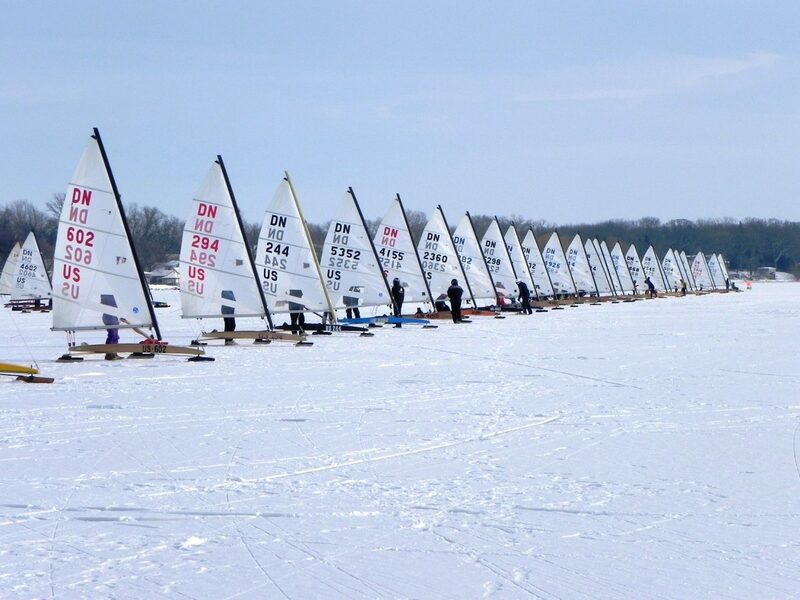 DNs line up to race on Lake Kegonsa. That sums it up, campers. The entire Western Region remains locked in single digit temperatures through Saturday, but there’s hope for Sunday. In Madison a high of 29 is forecast. I’ll be digging out my shorts and tank top. With the frigid temperatures of the last two weeks, we’ve got lots of ice now. Thick ice. Unfortunately, most of it is covered with snow. Dry, stiff snow. Where we have a combination of ice and snow, we’ve got drifts. Styrofoam-like drifts. Takes skinny runners and lots of breeze to power through. Green Lake, in Green Lake, WI and west end of Lake Mendota in Madison, WI were still teasing us for Westerns, but high pressure is going to keep the wind light for Saturday. Not the engine we’d need to power through the styrofoam. At best we might have gotten in a 1-day regatta. Not good, if you can avoid it. 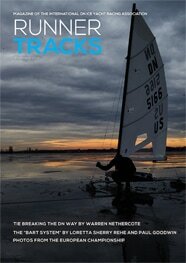 No Westerns, but team maDisoN is going to set up for scrub racing Sunday on the west end of Lake Mendota. Breeze in the mid teens and temps to 29 degrees should allow for racing. Technically this Middleton, WI. Launch at Captain Bill’s. Large portions of Green Lake and Lake Geneva are open, as are areas along the west shore of the bay of Green Bay. Warming temperatures next week could also improve some of our more lightly drifted sheets. So, remain hopeful that we can pull off Westerns next weekend, and join us for scrub racing this Sunday.